Congratulations to all the cyclists and fundraising team who took part in the Pat Casey Memorial Cycle between Cork and Limerick in 2014. The event was organised by Anne Casey and her son Daniel, with Brian Aherne and friends and family of the late Pat Casey. The proceeds of the cycle were divided between Cork University Hospital and ILFA. Members of the organising committee are pictured presenting a cheque to Dr Michael Henry, Respiratory Physician at Cork University Hospital. 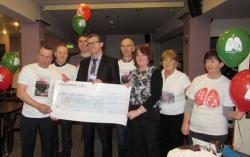 Congratulations and sincere thanks to all those involved with the fundraising event. Photo 1: Brian Aherne, Dr. Michael Henry, Anne Casey, Graham Desmond, Daniel Casey, Martin Casey, Linda Wallace and Mary O Donovan. Picture 2: Also features Lisa Gamble, Betty Gamble, Anthony Ford, Tim O' Sullivan and Ray Leahy. ILFA is pleased to announce that an educational article on Idiopathic Pulmonary Fibrosis written by Nicola Cassidy (ILFA) and Professor Jim Egan (Mater University Hospital Dublin) has recently featured in 2 leading Irish medical magazines. In November 2014, the article appeared in "Hospital Doctor" and in March 2015 it featured in "Forum", a magazine for General Practitioners from the Irish College of General Practitioners. 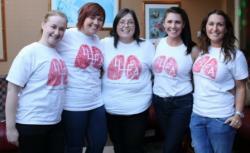 We hope that the article will help raise awareness of IPF among medical professionals. If your GP would like to know more about IPF, please refer them to the March 2015 edition of Forum. Rare Disease Day will take place on February 28. Click the link below to read an editorial in the European Respiratory Journal that highlights advances in awareness and research into rare respiratory diseases including IPF. 2014 was an incredibly busy and successful year for ILFA. This year we produced 3 bumper newsletters, developed 3 new information leaflets, held 2 patient information days and received 1 major award! Here are some more of the year's highlights. The new year started with the ILFA Swim in Sandycove in Dublin on New Year's Day. A group of brave and dedicated swimmers took the plunge to raise valuable funds for ILFA. In February, ILFA received a donation from ticket sales for "An evening with Liverpool Football Legends" thanks to Pamela Martin and The Liverpool Former Players Association. A great night was had by those who went to meet their football heroes. The month of March was all about raising awareness; ILFA hosted a stand the Irish Respiratory Nurses Conference in Dublin and also attended the launch of Organ Donation Awareness Week. Sunday Independent Life magazine (1/2/2015) featured the touching story of Phyl Troy who passed away from IPF in 2014. Phyl was a great friend to ILFA and helped lead a successful campaign calling for the HSE to approve funding for Pirfenidone for IPF patients in 2013. Phyl's husband, Liam Galvin, was interviewed by journalist Joy Orpen and shares Phyl's story to raise awareness of IPF and highlight the need for research. Congratulations and huge thanks to the Shamrock Vintage Tractor Club in New Ross, Wexford for organising a fundraising event for ILFA in December. 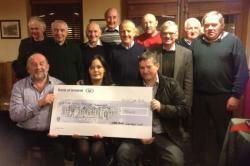 Seamus Murphy and his team of tractor enthusiasts raised the fantastic sum of €1350 for ILFA. The photo shows Seamus and members of the Shamrock Vintage Club presenting a cheque to Joan Devereux and her husband Paul on behalf of ILFA. Thank you to everyone involved. Congratulations to Angela Collins and her wonderful team of helpers for organising another successful Christmas/New Year concert in Ballydehob, Cork in aid of ILFA. 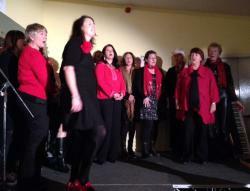 The concert took place on 30th December and was a great success. There were stellar performances from The Red Foxes; Gabriel O'Mahony, Lorcan Harris and Sean Parson (average age 9 years old) and Mongoose who have taken part in the concert for the last 4 years. 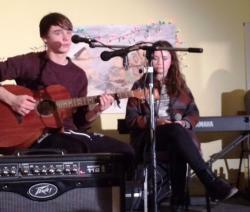 The photos also show Fiachra and Matilda O' Mahony and Acapella Bella who were fantastic. 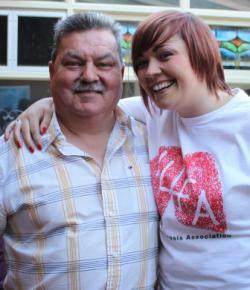 A great night was had by all and valuable funds were raised for ILFA. Sincere thanks to Angela for her dedication and commitment to fundraising for ILFA, to her enthusiastic team of capable helpers, the talented musicians, singers and performers, and the patrons who supported the event. In January 2009, my father took his first sick day off work that I ever remember him taking. Pat Malone was a real family man and loved his wife Chris, son Derek and 4 daughters Linda, Sharon, ...Gillian, myself and his grandchildren very much. He worked for CIE and drove the Bus Eireann bus from Kilkee to Limerick for many years. He was always a jolly, healthy man. He loved music and singing and was a member of the Kilkee church choir. He instilled his love of rugby in me and we spent many a day cheering on Young Munsters RFC and Munster in Limerick. It started with a flu, then pneumonia and then to our horror IPF. Like many others, we had never heard of IPF. I always wanted to do something to raise money for ILFA as without them my family would not have known so much about daddy's condition. Daddy fought like a trooper, taking his oxygen, learning how it all worked and still went out and about. Unfortunately, his condition worsened and he then needed to be in a wheelchair. Mammy was his 'Florence Nightingale' and looked after him so well from the first day he was diagnosed to his last. We still took him out to mass and even for the odd half pint of Guinness. On Monday 30th August 2010, I had my car packed and was driving back to start my first teaching job in London. He was very proud of me. But unfortunately that was the daddy lost his battle with IPF. Even in the ambulance that day he was apologising for 'ruining my plans'. He was always thinking of everyone else and hated if he felt he was a burden. On 30th August 2010 I lost my hero, my father and my best friend. We miss him more and more every day. 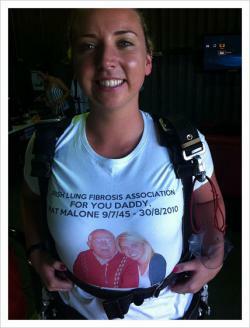 On the 3rd January 2015, I did a skydive in memory of my father Pat Malone in Sydney's North coast. I could hear him saying ' what kind of a mad idiot are you jumping out of a plane but good girl for doing it for ILFA' the day I booked it. It was originally booked for Byron Bay Australia for the 28th December but got cancelled twice due to bad weather (I think dad was testing me to see if I actually would do it). It was a fantastic experience and I felt very close to daddy the whole way. The encouragement and support I received was overwhelming and I want to thank all who donated to ILFA. In 2014, a total of 251 organ transplantations were carried out in Ireland thanks to the generosity of organ donors and their families who gave the gift of life to others. A record 31 lung transplant and 18 heart transplant operations were ...carried out at the Mater Misericordiae University Hospital. The number of kidney and liver transplants was lower than in previous years due to a reduced availability of organs. In 2014, there were only 63 deceased organ donors, compared to 86 donors in 2013. Congratulations and special thanks to the newly wed Tom and Audrey Erangey from Cork who married earlier this month and made a kind donation to ILFA in lieu of wedding favours. The video clip shows Audrey singing "The Prayer", dedicated to the memory of Jim Erangey, Tom's father, who had IPF. Audrey sang beautifully and did an amazing job. Everyone at ILFA would like to wish Tom and Audrey every happiness for their future. Congratulations to Sorcha O'Hagan who took part in the 5km Remembrance Run on November 9th to fundraise for ILFA in memory of her father in law. 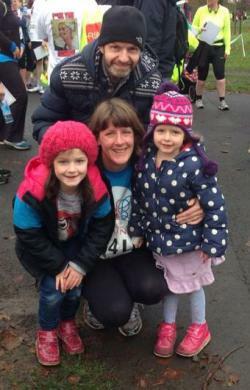 Sorcha is pictured with her husband John and two daughters after the race. ILFA is pleased to announce the launch of a new information leaflet entitled "The treatment of Idiopathic Pulmonary Fibrosis". This leaflet is a welcome addition to our series of educational resources on IPF. 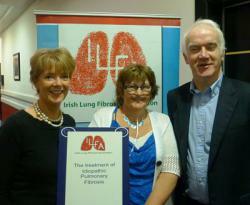 "The treatment of Idiopathic Pulmonary Fibrosis" was officially launched at the recent ILFA Information Day in Dublin. Pictured are Caroline Daly, Pamela Martin and Professor Jim Egan. Click here to read the leaflet. Our other leaflets can be viewed here. Congratulations to all the marathon runners! Congratulations to all those who took part in the Dublin marathon on 27th October. Alexandre Sayve from France travelled from Switzerland to take part and fundraise for ILFA in memory of his father Pierre. Alex is pictured with his friend Andrew Grehan who has completed 6 Dublin marathons for ILFA in memory of his aunt, Denise Cassidy. Also pictured are members of the Sayve, Grehan and Cassidy families who turned out to cheer Alex on marathon day. During the week, at a special ceremony held in the Mater University Misericordiae University Hospital, the Minister for Health, Leo Varadkar, congratulated the national lung transplant programme for reaching the milestone of 100 lung transplants since 2005. The multi-disciplinary team was praised for their skills, dedication and commitment to the success of lung transplantation in Ireland. Special tributes were paid to the donors and families across Ireland who make the gift of organ donation possible. 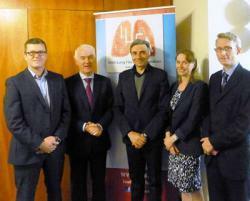 The 2014 Fergus Goodbody Memorial Lecture took place on October 9th in the Royal College of Physicians in Ireland, Kildare Street and was delivered by Professor Luca Richeldi, Professor of Respiratory Medicine and Chair of Interstitial Lung Disease at the University of Southampton. ILFA was set up in 2002 in memory of Fergus Goodbody who had Idiopathic Pulmonary Fibrosis (IPF). Every 2 years ILFA invites a leading expert in IPF to deliver the Fergus Goodbody Memorial Lecture to respiratory doctors and healthcare professionals to further their knowledge of IPF. This year, Professor Richeldi delivered the keynote lecture entitled "State of the art treatment for IPF". Professor Richeldi discussed the recent advances in clinical research with medications that can slow down the progression of IPF, and ongoing and future studies that may help with the monitoring, treatment and control of IPF. The other invited speakers at the educational symposium were; Dr Mike Henry (Cork University Hospital) who gave a lecture entitled "Treatment of Pulmonary Connective Tissue Disorders", Ms. Donna Eaton (Mater Misericordiae University Hospital) who spoke about "Lung Transplantation for IPF patients" and Dr Eoin Murtagh (Antrim Area Hospitals) who discussed "Establishing multidisciplinary teams for IPF in district general hospitals". 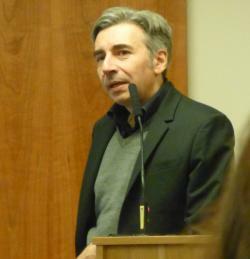 The meeting was chaired by Professor Jim Egan from the Mater Misericordiae University Hospital. The event was well attended by doctors and healthcare professionals from all over Ireland and there were lively interactive discussions following each of the presentations. Sincere thanks to Professor Richeldi and all the speakers for their time and valuable insights on IPF. During IPF World Week, Liam Galvin of the ILFA Committee met with Irish MEPs Mairead McGuiness and Sean Kelly in Brussels to discuss the EU IPF Patient Charter, the challenges of diagnosing IPF and the needs of IPF patients. 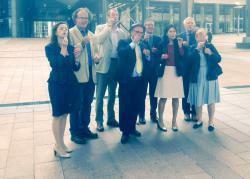 The EU charter was signed by the MEPs following its official launch. Please sign the charter and spread the word among your family, friends and colleagues. Visit www.ipfcharter.org to sign up today. Click here to read an article in the EU Parliament Magazine written by Andrey Kovatchev the Bulgarian MEP who co-hosted the launch of the EU IPF charter. 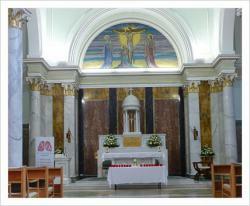 Everyone at ILFA would like to thank the clergy; the Reverend Vanessa Wyse Jackson, Fr Vincent Xavier, Canon Charles Mullen and Sr. Margherita Rock for the wonderful ecumenical service held on Saturday 4th October in the beautiful and peaceful Mater Hospital chapel. The service was very beautiful and meaningful for all those in attendance and indeed for those who could not join us but knew that we had gathered as a community to remember their loved ones and their own needs. Sincere thanks also to Harry Carpendale for his wonderful harp music and to all the readers and participants in the service. 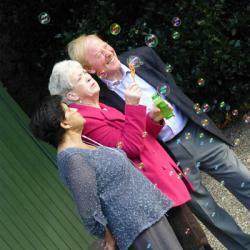 Thanks to Eileen O'Sullivan, Joan Doyle and Matt Cullen who helped out with the ILFA photo shoot to launch World IPF Week 2014. We were blessed with good weather on the day and had great fun in Fitzwilliam Square blowing bubbles and modelling for the camera. Have you sisgned the EU IPF Charter? Visit www.ipfcharter.org to sign up today. 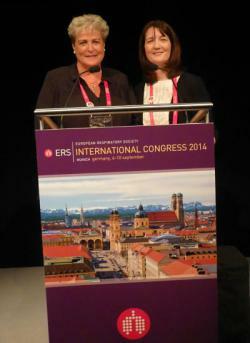 This year the European Respiratory Society (ERS) Congress took place in Munich, Germany, from 6th to 10th September. 22,000 doctors, nurses, scientists and healthcare workers from all over the world attended the congress, making it one of the largest medical conferences in the world. 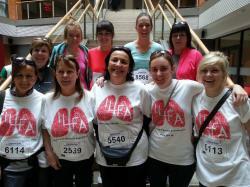 Congratulations to the ladies who took part in the Cork mini-marathon last weekend to raise funds for ILFA. We're very grateful for your support. Thanks to Emma Byrne who sent us in a photo of her team of relatives and friends. 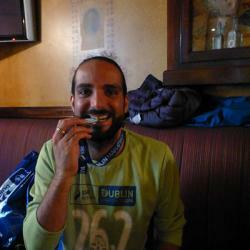 Congratulations to Eamon McGrath who took part in the Dublin City Half-marathon and fundraised for ILFA. Eamon said "It was a great experience and although I was carrying a slight injury and this was the first time I'd ran beyond 15k I finished in 2:14:59 and I was delighted with that. What made it so special for me though was, firstly the amount of sponsorship that I raised and which is still coming in, and the amount of support and well wishes that I got from colleagues, friends and family in the run up to and on the day of the run itself. This is by no means a one off and I intend to take part in other events and I will continue to support ILFA through sponsorship in these events"
Well done and thank you Eamon! Carbon Monoxide Awareness Week takes place for 22nd to 29th September. Carbon monoxide is a colourless, odourless gas that is highly dangerous. Have you got a carbon monoxide detector in your home? Visit www.carbonmonoxide.ie for more information and home safety tips. 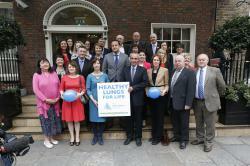 National Lung Health Awareness Week was launched on 16th September by the Minister for Health, Leo Varadkar TD. 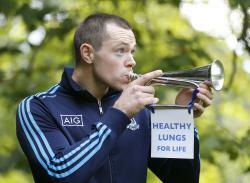 The week long awareness campaign, organised by the Irish Lung Health Alliance, will take place from 22nd to 29th September 2014. 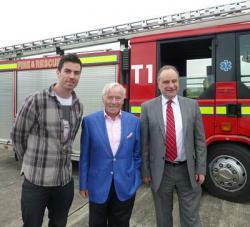 Click here to read the press release and visit www.lunghealth.ie to learn more. The HSE has announced a Public Consultation on Medical Card Eligibility. Click the link below to learn more about how you can have your say. ILFA is preparing a submission to the expert panel to request that lung fibrosis be included on the list of medical conditions eligible for discretionary medical cards. In addition, ILFA will prepare a letter for your local TDs asking them for their help to highlight the medical and financial difficulties faced by lung fibrosis patients and the urgent need for medical cards. We will upload the letter online so keep an eye on the website and facebook page over the next week. Please have your say. The closing date for submissions is Monday June 30th. The ILFA Patient Information Day took place on Saturday 5th April in Belfast. Terence Moran, ILFA Chairman welcomed everybody to the event and Joe Brolly, GAA pundit and organ donation champion was the first speaker. He was followed by Dr Joe Kidney, Professor Jim Egan, and Respiratory Nurses David Moore and Noren Baxter. Please click here to read more about the presentations. Good luck to ILFA Committee member Liam Galvin as he travels to Brussels to meet our European Parliamentary Members and take part in the official launch the European IPF Charter. Have you signed the charter? Visit www.ipfcharter.org now for more information. Idiopathic Pulmonary Fibrosis (IPF) World Week started in 2012 as an initiative to inform people that IPF is a rare and poorly understood chronic and ultimately fatal lung disease. Each year, around 35,000 people in Europe are newly diagnosed with IPF. During World IPF Week, IPF patient associations across the world join together to drive action for greater awareness of IPF, call for better access to care, and bring hope to those living with the condition. Good luck to all the ladies in Cork who are taking part in the Cork Mini-marathon to raise funds for ILFA this weekend. Those taking part for ILFA include family members Emma Byrne, Breda Byrne, Angela Byrne, Ellen Byrne and Joanne O'Brien, Catherine O'Sullivan and mother and daughter team Aileen Swords and Noreen Ring. Here's hoping for good weather and race conditions! To raise awareness of Pulmonary Hypertension (a common complication for many IPF patients), the Pulmonary Hypertension Association of Ireland will try to break the Guinness World Record for the longest kissing chain in the world. The event will be held in St Brigid’s GAA Grounds, Russell Park, Navan Rd., Dublin 7 on Sunday 28 Sept at 1.00 pm. Good luck to our marathon fundraisers! Good luck to Aine Donegan as she takes part in a pulse triathlon in aid of ILFA on 20th September. Here's hoping for kind weather and good conditions for swimming, cycling and running! Go Aine! 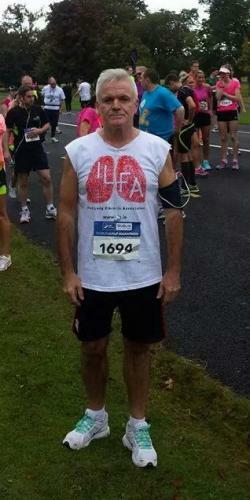 Best of luck to Eamon McGrath as he takes part in the Dublin City Half Marathon this weekend to raise funds for ILFA. We're cheering Eamon on all the way! Good luck to Tom Erangey who will take part in the Charleville half marathon on Sunday 21st September. 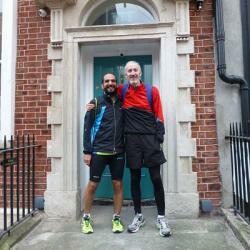 This is Tom's second marathon fundraiser for ILFA this year and his training is going well. Well done and best of luck Tom! Good Luck to the Cork cyclists ! Good luck to all the cyclists, volunteers, and organisers taking part in the Cork to Limerick to Cork cycle at the weekend. Friends and family of the late Pat Casey (RIP) are fundraising for ILFA and Cork University Hospital in Pat's memory. We wish them every success with the cycle and hope the weather is kind and the hills are gentle. Everyone at ILFA would like to wish Conor Jennings the very best of luck as he travels to the UK to take part in the world famous Great North Run. The half-marathon will take place on Sunday 7th of September. We're cheering Conor on all the way. Go Conor! Next week delegates from ILFA will attend the European Respiratory Society (ERS) Congress in Munich. ILFA submitted an abstract (summary of work) to the ERS called "The 2000 Steps a Day Challenge: A tailored exercise programme for Lung Fibrosis patients", describing the preliminary work carried out to develop and assess the exercise challenge with 15 patient volunteers. The abstract was chosen for a poster discussion at the congress. ILFA will have the opportunity to showcase our project during an educational session entitled "Latest insights in physical activity, exercise testing and muscles". Family and friends of the late Pat Casey (RIP) are organising a special memorial cycle in Pat's honour to raise funds for the ILFA and Cork University Hospital. Pat, his wife Anne and his friends organised two previous charity cycles for ILFA in 2012 and 2013. Pat was a dedicated fundraiser and he was a huge support and inspiration to others especially those with IPF. To celebrate Pat's life and to help raise much needed funds, an organised cycle from Cork via Tipperary to Limerick will take place on Saturday 13th September 2014. 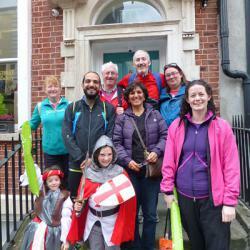 Overnight stay will be in The Southern Court Hotel, Raheen, Limerick and the return cycle from Limerick to Cork will take place on Sunday 14th September 2014. Registration cost is €55 (to cover one evening meal and an overnight stay B&B in The Southern Court Hotel). Click here to read an article by Maria Tracey that featured in The Cork News entitled "If it helps one person, it makes a difference". Congratulations and thanks to Helen Durney and her family and friends in Newbridge, Kildare who raised €2050 for ILFA by holding a coffee morning and also taking part in the Women's Mini marathon. Helen and her daughters and friends Helen Durney-Carr, Pauline Mooney and Geraldine Browne are loyal fundraisers for ILFA and their dedication and support is greatly appreciated. Congratulations and enormous thanks to Lorraine Ryan and her dedicated team of amazing volunteers who raised an incredible €1500 for ILFA by holding a Table Quiz in The Spotted Dog pub in Limerick in July. Pictured right are the organisers; Carrie Halvey, Lorraine Ryan, Hazel D'Arcy, Dawn Conway and Lynsey Shine. This was the third year for the hugely popular Table Quiz and Lorraine and her friends deserve huge credit for their great commitment and generosity. A great night was had by all with music by DJ Will, a raffle with great prizes and tasty food. 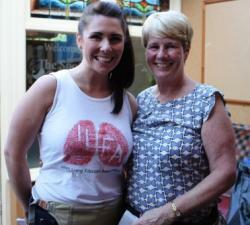 Sincere thanks to all the local businesses and community who supported Lorraine in her fundraising activities. Pictured left to right below are: DJ Will and Dawn entertaining the crowd, Dawn and Ann Conway who helped with the raffle and Brendan and Lorraine Ryan. Congratulations and thanks to the "Troy Trotters"
Congratulations to the "Troy Trotters" from Tipperary who raised the fantastic sum of €3000 for ILFA by taking part in the Flora Women's Mini-Marathon in June. The team was brought together by Antoinette O'Dowd to raise funds for ILFA in memory of their much loved relatives Phyl Troy, Daniel Troy and Peggy Troy; siblings who lost their lives to IPF. Well done and huge thanks to Antoinette O'Dowd, Kathleen Troy, Amanda Dillon, Megan Troy, Roisin O'Dowd, Hannah Chapman, Mary Troy Ryan, Rebekah Troy, Claire Finlay, Jackie Fogarty, Nancy Ryan and Helen O'Leary pictured here with some of the other ladies who took part. 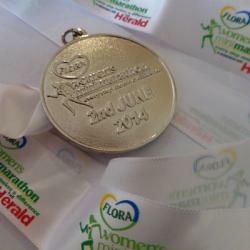 The 2014 Flora Women's Mini-Marathon was another great day that epitomised fun, camaraderie and goodwill for ILFA and so many other wonderful charitable causes. Despite the lack of blue skies and sunshine, the weather was kind and surprisingly warm with a welcome gentle breeze and thankfully only two light showers. This year the ILFA team was made up of over 40 dedicated and enthusiastic ladies from all over the country. 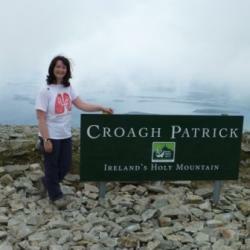 Well done to Nicola Cassidy, ILFA committee member, who climbed Croagh Patrick last week and also took part in the Flora women's mini-marathon on 2nd June and the 40km ILFA cycle on 25th May in aid of ILFA. 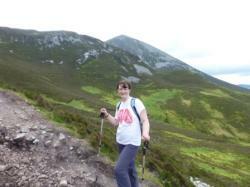 Nicola said "Climbing Croagh Patrick was a real challenge and a wonderful experience. It was great to reach the top and raise some valuable funds for ILFA in doing so. 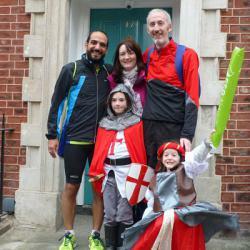 Sincere thanks to all my family and friends who have kindly sponsored me for the 3 fundraising challenges in 2014. I am very grateful for all your support and encouragment." A big thank you to all the ladies who took part in The Flora Women's mini-marathon in Dublin and to all those who took part in the Cork marathon, half-marathon and mini-marathon. You are all amazing and your efforts are much appreciated by everyone at ILFA. Have a well deserved rest! Congratulations to all those who took part in the Great Limerick Run in aid of ILFA. We hope everyone enjoyed the race. Thanks to Lorraine Ryan for sending us in a photo of some of the members of the ILFA team. Pictured from left to right are Rachael Casey, Caroline Fahy (wearing a number saying "Hazel") Noel Casey, Lorraine Ryan and Tricia Fitzgerald. The other particpants included Dawn Conway, Mike Lynch and Siobhan Ryan. 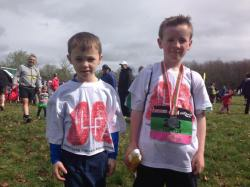 Congratulations to Dylan O'Brien, aged 8, for taking part in the Great Ireland Run on Sunday 6th April. Dylan was cheered on by his brother Kyle and his parents Chelsea and Tony. 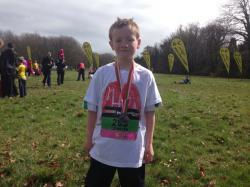 Not only did Dylan raise funds for ILFA, he also smashed his personal best running time. Well done Dylan on a great performance! Thank you for your support! Dylan's mum said " Dylan really enjoyed it. He finished in under 10 minutes which is a 5 minute improvement on his time from month ago when he started training for it. We're all very proud of him and looking forward to his next run!" Dylan is pictured here with his medal and also with his brother Kyle who cheered him on all the way. The first annual report from the National Organ Donation and Transplantation Office (NODTO) was launched last week. In 2013, there were 86 organ donors in Ireland and 294 organ transplants were performed at the three transplantation centres; the National Heart and Lung Transplant Programme at the Mater Misericordiae Hospital, the National Renal and Pancreatic Transplant Programme at Beaumont Hospital and the National Liver Transplant Programme at St Vincent's University Hospital. In Europe, the leading countries for organ transplantation were Croatia, Spain, Belgium, Malta and Estonia. Ireland was in 16th place out of 31 countries. In order to improve Ireland's performance and increase the rates of organ donation and transplantation, the report sets out a number of targets for 2014 transplant activity, including a public awareness campaign. In the last 5 years (2009 to 2013), 63 lung transplants were carried out at the Mater University Hospital with an average of 12 lung transplants per year. 2013 was the most successful year for lung transplants since the beginning of the National Lung Transplant Programme in 2006 and last year 32 patients received a lung transplant. 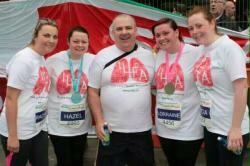 The target for 2014 is to achieve 30 lung transplants. The average 5-year survival rate for a patient following a lung transplant was 81% compared to 51% in the United Kingdom and 55% internationally. Results for the 10-year survival rates are not yet available as the lung transplant programme only started in 2006. The remarkable 5-year survival outcome is a real measure of the success of the Irish lung transplant programme and is a credit to the skills of the surgeons, doctors, nurses and people caring for transplant recipients. The NODTO Annual Report was launched by the Minister for Health, Dr James Reilly and he paid tribute to the families of the organ donors for their enormous generosity. Have the conversation about organ donation with your family today. Click here to see a video of the launch. Well done to everyone who took part in the 40k and 100k cycle challenges in aid of ILFA! What a great day! We were blessed with good weather, enthusiasm and high spirits. Congratulations to Paddy O'Mahony, his family, friends and colleagues at Dublin Fire Brigade for organising the hugely successful 40k and 100k cycles to raise awareness about organ donation and lung fibrosis. The cycle was dedicated to the memory of Elio Lodola, father of Brendan and Mario. Thanks to the ILFA Patrons, Senator Feargal Quinn and GAA star Michael Darragh Macauley for taking part in the photo shoot and for giving the starters orders after a set of touching speeches from Paddy O'Mahony, Professor Jim Egan, Michael Darragh Macauley, Pat Fleming, Senator Feargal Quinn, and Brendan Lodola. 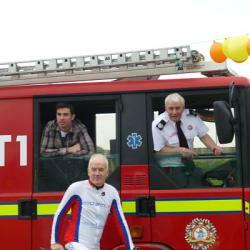 Special thanks to everyone at Dublin Fire Brigade for supporting the ILFA cycle so wholeheartedly. ILFA would like to acknowledge the great support and generosity of Chief Fire Officer Pat Fleming for allowing us to use the facilities at the O'Brien Institute, Marino; Paddy O'Mahony, Brendan Lodola and Mario Lodola did an amazing job organising the event and they thought of everything; the pipers and drummers from the Dublin Fire Brigade Pipe Band played amazing music and helped get the adrenaline flowing; and the advanced paramedics, safety car and motor bike drivers and marshals all deserve high praise for their excellent skills in keeping everyone safe around the courses. Thanks also to the O'Mahony family; Pauline, Jacqueline, Deirdre, Terry Snr, Terry, Pamela and Mary for looking after the registration desks and making great sandwiches; to the chefs for the delicious hot food; to the band for treating everybody to wonderful music after the event; to all the staff of the O'Brien Institute and Dublin Fire Brigade who helped out with their time and talents; and to the members of the Dublin Fire Brigade cycling club who took part in the cycle. Sincere thanks to the team at TV3 and Ireland AM for inviting Paddy O'Mahony, lung transplant recipient, and Terence Moran, ILFA Chairman, to the studio on Thursday 22nd May to raise awareness about organ donation and lung fibrosis. Well done to Paddy and Terence. Click here to see the interview. Public Consultation on Medical Card Eligibility - call to action! ILFA has developed 2 questionnaires, one for patients and one for caregivers, to help us find out more about the physical, emotional and practical challenges of living with Idiopathic Pulmonary Fibrosis (IPF). The surveys should take about 10-15 minutes of your time to complete. We would like you to tell us about your experiences and how IPF impacts on your daily life. The feedback will be analysed and a report will be prepared. This will be made available to read in a future ILFA newsletter and on the ILFA website and social media in the coming months. If you do not have IPF but have another respiratory condition, you are welcome to participate but please indicate your respiratory condition on the questionnaire. Thank you for sharing your experiences. Please fill in the survey that applies to you (patient or caregiver survey) by clicking on the links below. A fundraising cycle to raise awareness of Lung Fibrosis and Organ Donation will take place on Sunday 25th May 2014. The cycling challenge is being organised by Paddy O’Mahony, District Fire Officer and lung transplant recipient, and supported by his colleagues in the Dublin Fire Brigade at Tara Street Station. There are 2 cycle routes to choose from; (1) a 100 km Challenge Route north along the Dublin coast for the more experienced cyclists (2) a 40km Leisure Route for the less experienced cyclists. The starting and finishing point is the O’Brien Institute in Marino in Dublin which is the Dublin Fire Brigade’s Training grounds. The event will start at 10.30am. Refreshments will be served after the race. It promises to be a fun day and all are welcome. Please note that the cycling challenge is for adults only. Participants are asked to either collect sponsorship for the event or to pay a €20 registration fee. For more information please call Paddy on 087 412 8612. Alternatively contact ILFA by email, info@ilfa.ie, or call 086 871 5264. Mr Terence Moran (Chairman of ILFA); Dr Joe Kidney (Respiratory Consultant, Mater Infirmary, Belfast); Prof Jim Egan (Consultant Respiratory and Transplant Physician, Mater Hospital, Dublin); front l-r: Mr Matt Cullen (IPF patient); Mr Joe Brolly (GAA All-Start & pundit, and organ transplant champion); Mrs Teresa Cullen. ILFA is pleased to announce the launch of our new information leaflets entitled "Getting the most out of your hospital appointment: Advice for Idiopathic Pulmonary Fibrosis patients" and "Advice for carers of patients with Idiopathic Pulmonary Fibrosis patients". The content for these leaflets was based on discussions held at the IPF patient support groups. The leaflets have been awarded the NALA Plain English mark from the National Adult Literacy Association (NALA) which means that the language used is clear, concise and understandable. Click on the link to view the leaflet or contact ILFA by emailing info@ilfa.ie or call 086 871 5264 to request copies. 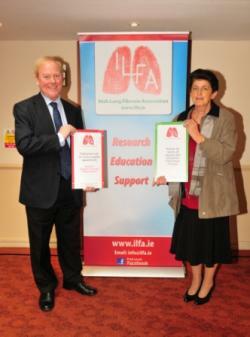 Special thanks to Matt Cullen (IPF patient) and his wife Teresa for helping to launch the new information leaflets. Matt and Teresa are pictured here. The ILFA Spring Newsletter is now available to read online. Please click here. If you are not already a member of ILFA, you can register to receive future newsletters by post by emailing info@ilfa.ie, register online at www.ilfa.ie, or call 086 871 5264.